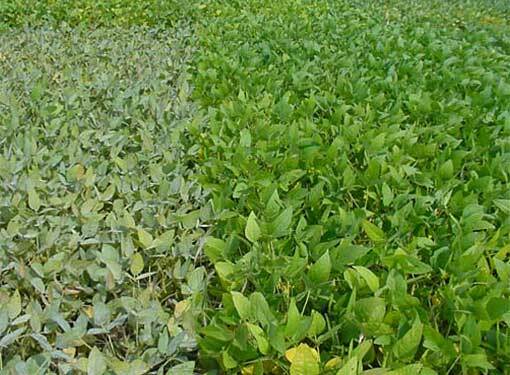 Soybean varieties can differ dramatically in their reaction to powdery mildew, as demonstrated in this research trial of varieties susceptible (left) and resistant (right) to powdery mildew. Photo: University of Wisconsin. 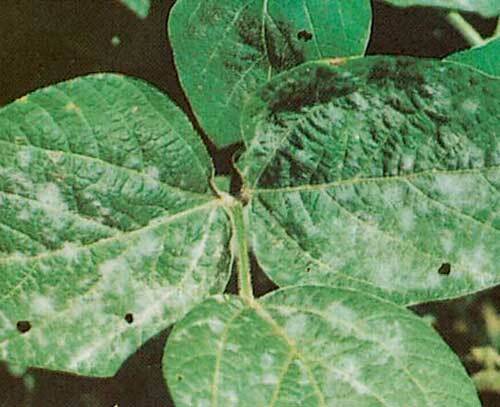 Powdery mildew is a common leaf disease of many crop and ornamental plants, including soybean. 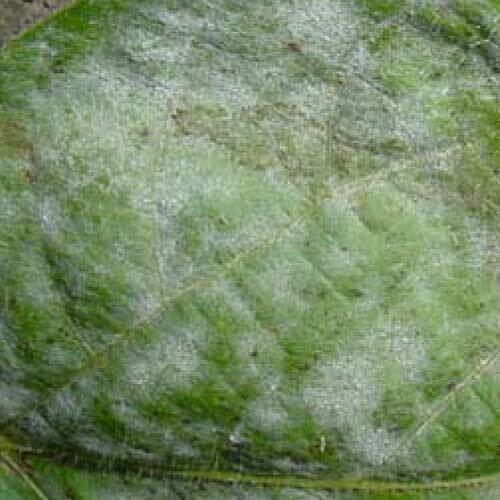 Soybean powdery mildew is caused by the fungus Microsphaera diffusa. Powdery mildew on soybean requires cool air temperatures and low relative humidity. This combination of temperature and relative humidity is not common during the summer in the Midwest, so powdery mildew is a disease that occurs only sporadically in the region. Epidemics have occured about every 10 to 15 years. 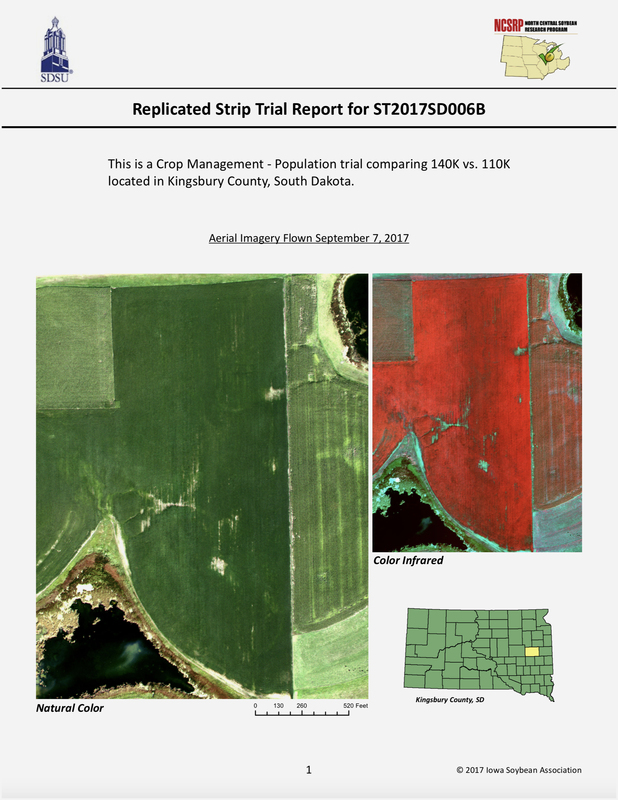 Research studies have estimated yield loss by comparing yield of plots treated or not treated with a fungicide or comparing yield of resistant and susceptible cultivars during powdery mildew epidemics. Measured yield losses of 0 to 10 bushels per acre were estimated in Iowa studies, and 0 to 5 bushels per acre in Wisconsin. 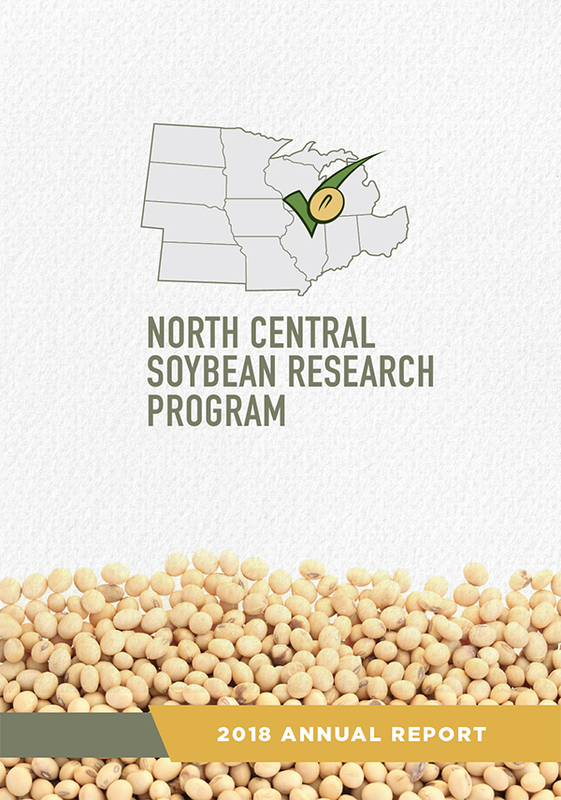 Late-planted soybean are at higher risk of yield loss than early-planted soybeans. Cool weather (66-74°F) is most favorable for mildew development, and disease incidence is greater in seasons with cooler than normal temperatures. Rainfall does not seem to affect the disease. Plants are susceptible at any growth stage, but symptoms are rarely seen in the field until the mid- to late reproductive stages. Occasionally, infected leaves may have yellow patches or browning tissue between veins, but these symptoms may be masked when the powdery fungal growth is abundant. Yellow spots and veinal necrosis can be signs of a resistant reaction to infection. Crop rotation is not effective because the pathogen is readily introduced into fields by long-range dissemination of wind-blown spores. Powdery mildew is frequently more severe in late-planted soybean fields. 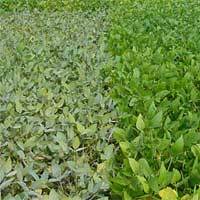 Large differences in disease severity can be observed among soybean varieties. However, it is difficult for companies to breed for resistance because powdery mildew pressure is low or nonexistent in most years. Generally, most determinate soybean cultivars are highly resistant to powdery mildew, while many indeterminate cultivars are susceptible. Several fungicides are labelled for powdery mildew and can be effective, if necessary. The white powdery patches are the fungal mycelium (vegetavie body) and spores of the fungus. Photo: University of Wisconsin, Plant Pathology. Click on image to view a larger version. Signs of the powdery mildew fungus are easy to recognize as white powderlike patches on all above-ground plant parts. Photo: Dean Malvick, University of Minnesota Click on image to view a larger version.